I am beginning to understand what people mean by no one goes to seminary alone. This statement I have heard a lot since my wife started her winding path for her Masters of Divinity, and I am beginning to understand what they mean. I have learned so much about my faith and about the scholars and great thinkers of Christianity that came long before me. I didn’t expect to learn as much as I have through my wife’s education. Through discussing some of her early courses to help find out how she actually believes, I applied the same lessons and questions to myself. That is where it began. We were going to a Church of Christ at the time and the particular one we were attending was more of the liberal end of the spectrum. Through these questions and self-reflection, we learned that the denomination as a whole was not what we actually believed. That brought us to the United Church of Christ, and that one word makes a lot of difference. It is a very liberal denomination and has been very good for both of us. It has allowed us to continue to grow and heal from the wounds of our past. Those of you that have read my blogs for a while will know that my mind goes into all kinds of different places as does my spirit. Talking this week with the pastor of Wedgewood United Church of Christ over lunch something of a realization came about. There are a few constants in my life that I continue to return to. First, I am someone that seeks to understand how things work and how things function. This is also very true with my faith. This seeking to understand got me into a lot of trouble when I was 10 years younger. I had to know how the physical, metaphysical, spiritual and mental physiology of existence worked. I do this in my career. I do this with everything that I get my hands in. Until I understand the layers of how things function I do not feel that I understand anything at all. Take a car for instance. It is not enough for me to know you have to have a good battery, gas in the tank and the key in the ignition to make the car start when you turn the key (or hit that little button now). No, I had to understand how the fuel made it to the engine, how the battery turned into combustion to set the engine running. Still with cars, the components that I don’t understand make me feel like an idiot sometimes when it comes to cars, but yet many of my friends will call me for advice when they are having car trouble. Many times I do know the answer or know how to change the part that is giving them problems. It is those missing pieces of things that prevent me from calling myself a mechanic, even a shade-tree one. When it comes to faith that is very hard to do. Solomon was given wisdom to the fullest extent and I doubt he understood how it all worked. Part of faith is accepting that we don’t know how it all goes together, but trusting that when we turn the key the car will start. Millions of people do it every day. You don’t understand how all that stuff under the hood works, but you believe it will work. You have seen it work and you trust in it. Look to the lives of the elders of our churches, by title or experience, and see how faith has guided them through the good times and the bad. You can see the same thing there. The only difference is that you can open the hood and see the engine. Pulling back the veil between the physical and the spiritual is not as easy. There are those that have seen what is behind the veil and will say with certainty that there is something there and that it is certainly not just some hocus pocus. Second, I have a deep love and respect from nature that I gained through connection with my father. That love and respect is not just on the level of the mountains are beautiful we must preserve them. No, it runs much deeper than that. Somewhere along the lines of a returning respect. If you respect and take care of the earth/nature it will in turn do the same for you. My father ensured that I could survive off the land and the whole thing of only take what you need and no more was there as well. My father is not a main of faith, but is a spiritual person, even if he would not like to admit it. This respect and care for nature is a spiritual thing for me. It is part of my faith. It is part of who I am as a person. I have seen animals in the wild up very close when I should not have. We would not hunt or fish for sport. Even when we hunted things we did not personally eat, we make sure there was someone around that we could give the meat to before we would even step foot in the woods for that purpose. Yes, this is coming from someone that considers himself liberal. Mind-blowing I’m sure to some. As many from Eastern Kentucky, I am heavily Scotts-Irish. Granted truth be told I’m a good old mutt with blood from whatever my ancestors happen to fall into love with. Since I began reading, I was drawn to mythology nearly as much as I was drawn to fantasy. It started out with the standards of Greek and Roman. Then I expanded with the Roman Empire to Egyptian and Celtic. Norse had become my favorite by the end of things. Norse and Celtic Mythology still to this day hold a very special place in my heart. That pulse around those two were always strongest. 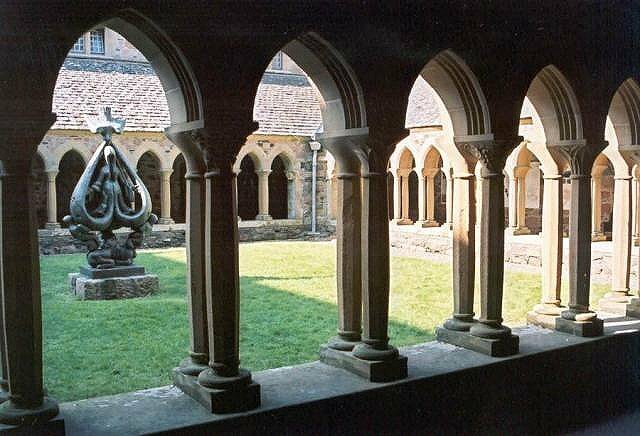 Celtic Christianity is a new chapter in my search and seeking. That respect of nature is there. It brings some of my beliefs that I have held firm to into a new light of acceptance. The principle of God being within the creation is the core belief that I am speaking towards here. I touched on this in my last article. I believe this is the case. I believe that God is in everything he created. She placed her hand in everything and gave it that spark to live for the time it should live. His hand was placed into each of us and the soul that is within us; the spirit the dwells within is our connection to that divinity, but not just in the metaphysical sense of the word. No this connection is the same as a piece of hair is to the head. It is part of the creator. It is part of who and what we are as a whole. We can look a little deeper into we are the Body of Christ. Each of us is a cell of what would make up the Body of Christ. We have that divinity within us. That is why by nature we desire to do good. We desire to help. It is after the world has made us feel that we are not connected to anything else that we stop believing and become jaded to that inner nature. As Pelagius would speak to, you can’t tell me that a child starts out life with the desire to do harm. There are many reasons why there is evil in the world. Another constant is that understanding that there is evil out there. That evil is physical and metaphysical. It is real and touchable just as much as it is invisible. When I took my first step off the path of Christian Faith to another faith it was to a nature based faith. My first step was Wicca. I won’t go into the details of what I learned there, but in the end it was the fact that there was almost a denial that Evil existed that drove my feet further along that road. I knew that evil was there. As I told Chris, Never did I stop believing in the existence of God; likewise I never stopped believing that the demons were just as real as angels were. Even now reflecting on the experiences that I have along this interesting road that I find myself on, I have a hard time believing that what I have seen and felt actually happened. I can tell stories for days that would make for great fiction. Alas, that evil exists. Why does it exist? Because it must. I have accepted this fact. Right now in this imperfect world and imperfect existence that we find ourselves in. Evil must exist. It serves many purposes. J.R.R. Tolkien is most known for The Lord of the Rings and the Hobbit, but those are far from his only works in middle earth. The Silmarillion is one of these other works. In this book is the creation story for middle-earth. In it you have the creator god character, Iluvatar who created these Angelic eternal spirits called the Ainur. Among them you have Melkor, who was entrusted with the larger part of the plan than the others. Well as they were singing the world into being, Melkor liked a few of his ideas better so he starting bringing in dissonance into the song. Many began to follow his song. It was essentially bringing Heavy Metal into an Ethereal Opera is the way it plays out in my head (Go figure). Well, others started singing with him. Illuvatar would guide the song back. When it was done, Illuvatar called out Melkor and told him that the darkness that you have sang was to my design and through it the greater glory manifest. Without Melkor being the Lucifer, the rest of creation would have been lack luster. There is no secret that Tolkien was of the faith, in fact chatted with C.S. Lewis quite a bit. That would have been some interesting bible studies. I believe that part of the story was heavily influenced by Tolkien’s study of the nature of God. God was no fool; he knew Lucifer would rise against. We children screw up. We fall short of the mark. We always have and we always will. It is the nature of imperfection. As this world is imperfect. Through the failings of one of Gods most beloved we can find that way back to the father. Anyone who asks, it shall be given. You can find your way to the Heart of God. Momma is still waiting. The song is still being sung. Creation is still going, it’s not over yet. Find who you are and who our creator made you to be. That personal identity is very important. “If you don’t believe in something, you’ll fall for anything,” comes to mind. For me my walk will continue to be an interesting one. I cannot thank everyone that influenced me enough. No matter how little or large the act, it has made things very interesting. Faith is the shield that I carry. Strangers passing in the night that I will likely never see again all the way to the clear and obvious mentors that held my hand through trying times. I thank you all. For those of you that I am currently saying Hello to, take from me what you need. Enjoy your personal journey to God. However, know that your personal walk does not need be a solitary one. If I can find like-minded people to converse with, you can as well. I leave you today with “The Glory in the Grey” by George MacLeod. May peace be with you in whatever path you might be on. to challenge us to love.